Not storing data is cheaper than storing it. 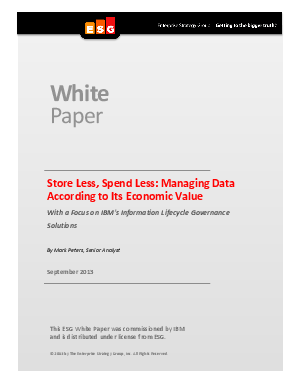 As enterprise data continues to grow and IT budgets remain flat, organizations need to more effectively maximize existing storage capacity and manage storage spend based on data value. In this white paper, Enterprise Strategy Group Sr. Analyst Mark Peters demonstrates how IBM's Information Lifecycle Governance solutions can help IT buyers improve the information economics for their organizations by curtailing data growth through defensible disposal of data.